When last seen for the USA, Alejandro Bedoya was captaining a team that squandered two penalty kicks in a Gold Cup game it had to win by three goals. It did. With the U.S. atop Group B courtesy of a 3-0 defeat of Nicaragua, he departed after the match to join his wife Beatrice for the birth of their second child. Joe Corona and Dom Dwyer had failed to convert from the penalty spot, but Bedoya earned U.S. Soccer Man of the Match honors by setting up two of the goals and contributing in varies ways all over the field. In the absence of Michael Bradley during the group phase, Arena had twice given the captain’s armband to Bedoya, who was the most-capped player named for the initial Gold Cup squad of 23 players. His appearance against Nicaragua was the 64th of his U.S. career, which dates back to a friendly against Honduras in January 2010, during the reign of former head coach Bob Bradley. The past year has been a tricky one for Bedoya, who while adjusting to MLS after playing in Europe since leaving Boston College in 2009 also flowed with the transition from Jurgen Klinsmann to Bruce Arena. He’s gone through ups and downs with the national team while deployed in various roles under the three head coaches, but has yet to be dislodged from the pool. For the USA, he’s played out wide or in the middle as an attacking catalyst, has occasionally filled a holding role, and has also taken on the job of box-to-box midfielder who can bust up opposing attacks and get the ball moving in the opposite direction. 'It’s a like a breath of fresh air.' To set up a goal for Kelyn Rowe against Nicaragua, Bedoya pushed forward to intercept a square pass and take a return ball from Dwyer to lay it into Rowe’s path. In those few seconds, he displayed positional acumen, defensive bite and passing accuracy, all elements vital to Arena’s transformation of the team since taking over nine months ago. Without Bedoya, who was one of six changes to the team’s squad, the USA rolled through its three knockout matches to capture the Gold Cup, for which Arena used a blend of veterans and younger players. Bedoya welcomed into the world a daughter, Milena, and soon got back to the business of manning midfield for the Philadelphia Union, which bought his rights from French club Nantes, the final stop of a European sojourn that encompassed four teams in three countries. 'He’s a real handful, a true professional.' Since the Gold Cup final, Arena has been attending and watching MLS matches as well as monitoring the U.S. players in Europe. Last week he came to San Jose to see it play the Union. The Quakes stunned Philly with a stoppage-time penalty kick to grab a 2-2 tie, and after the match Arena had a long chat with Bedoya, who had recently been named captain by head coach Jim Curtin. Obviously, Arena was prepping Bedoya for the call-up that would bring him back into the fold. “He has that tireless workrate,” says Curtin, who normally uses Bedoya alongside Haris Medunjanin as the twin central mids in a 4-2-3-1 formation. “Other teams just don’t like playing against Alejandro. He’s a real handful, a true professional, and a guy who we asked to wear the captain’s armband for us and he’s done a heck of a job leading by example. The game against Costa Rica Friday at Red Bull Arena will take him back to his roots. Born to Colombian parents in Englewood, N.J., Bedoya passed up MLS to follow fellow Boston College product Charlie Davies overseas. They dreamed of playing together as pros as well as for the national team and attained both goals, albeit by very different paths. 'He embodies the Philadelphia Union player.' Yet being named to captain your country as well as your club is a rare distinction regardless of circumstances. When Arena took over from Klinsmann, the coach said he wanted the team to restore its gritty, hard-working identity as well as upgrade the passing in midfield. Bedoya fits the bill in both categories for both of his teams. Bedoya didn’t make the cut for the 2010 World Cup team -- at that point in his career he had just three caps -- but at the 2014 competition he started three of four games and came on a sub against Germany. Last summer at the Copa Centenario he started the five games for which he was eligible -- he sat out the semifinal against Argentina with a suspension. That's a good track record and no predictor of what may happen next year. Competition for midfield spots has intensified as Darlington Nagbe, Kellyn Acosta and Christian Pulisic have carved their names into the first team, but Bedoya’s versatility, experience and toughness are highly prized by Arena. And the U.S. still has no lock-down option at right midfield, where Paul Arriola and Jordan Morris and Fabian Johnson are all in contention for minutes. 'It’s a very chill atmosphere.' Faced with myriad decisions for upcoming Hexagonal matches as well as plans for Russia should the U.S. qualify, Arena has no shortage of issues to resolve. 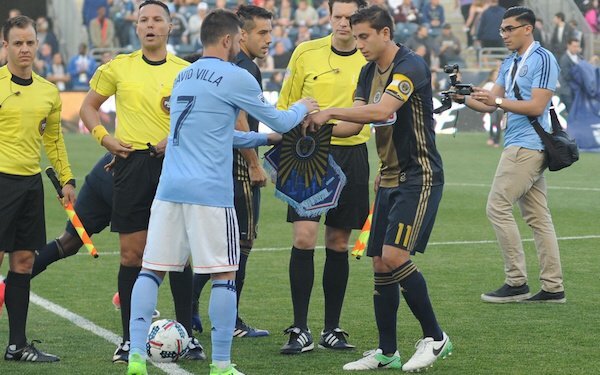 Bedoya, like his teammates, is convinced that both on and off the field, Arena has righted a ship that had veered wildly off-course. 2 comments about "Alejandro Bedoya fits the bill for both club and country". :: SilverRey ::, August 31, 2017 at 9:51 a.m.
Quick correction: "...Arena had a long chat with Bedoya, who had recently been named captain by head coach Jim Curtin"
Bedoya has been captain of the Union for the majority of the time since joining the team. Medunjanin is usually captain in his absence. James Froehlich, August 31, 2017 at 4:20 p.m.
Great to see Ale get some recognition. I've always felt that his passing ability is enhanced when the people around him are comfortable with a short passing game. His willingness to foul when necessary is also needed given MB's inability to ever play the "hard man" role.